Data goes out of date. Over time every database accumulates inaccurate contact records. A database review is a key tool in keeping your data relevant. Estimates vary, but between 1% and 5% of the contact records on your database go out of date at the end of each month. So in a year's time anywhere between 10% and 60% of your contact data will be wrong. A database review should look at your database for out of date contact details, as well as duplicated contact records. The initial database set up involved the expenditure of a lot of time and energy. Your database may be a really good snapshot of your data needs at the time it was configured, but is that still the case? Are you collecting data for projects that have ended? Do you still work in the same way? Are there activities with clients and stakeholders you need to record that didn't happen 3, 2 or even 1 years ago? Equally are there any activities listed on your database that are now obsolete? How many staff have moved on since your database was introduced? Are new staff trained to the same level? Do you have documentation to help staff record common procedures in a uniform way? CiviCRM is constantly being updated. Functions that weren't available when your system was built may now change the way you capture data. CiviCase groups activities together around an individual, or an internal process. So you can track a client through a counselling or support service, or have a standard procedure for tracking volunteer applications. CiviBooking manages an internal room booking system. CiviDiscount allows you to create discount codes (one off, limited by number or ongoing) to be used against membership prices or event bookings. Or maybe there are features of CiviCRM (integration with Paypal, sending SMS's to contacts) that would be useful to your organisation now that you thought you didn't need when the system was designed. Does your database need to change? Are staff not entering data because the process is too cumbersome? Is some data still collected in spreadsheets or other documents instead of CiviCRM? Do website users not complete forms because they are hard to find? Or just too long? 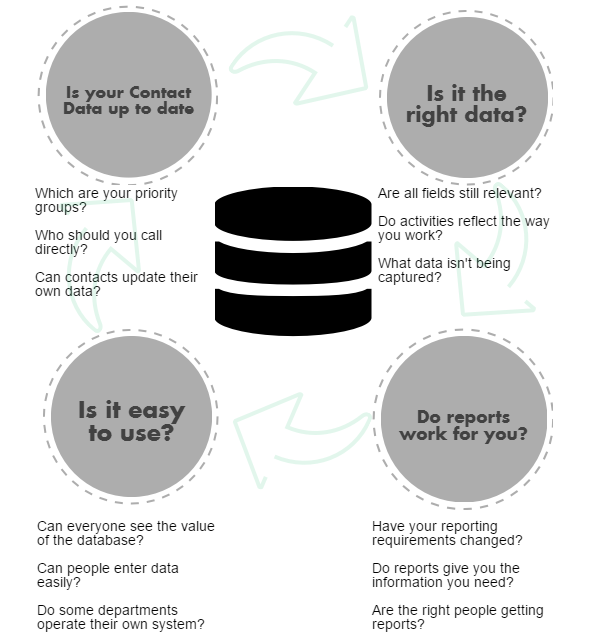 A database review is an ongoing process that keeps your database relevant as your organisation grows. Review and take stock of your database. You don't need to cover all the issues raised above at once, decide the priorities for your organisation and take steps to tackle an issue at a time. Do your regularly review your site for duplicate contacts? CiviCRM includes merge and dedupe tools to do this. Can you approach your contacts directly and ask if their details are correct? This is an onerous task to carry out with all contacts, but may be appropriate for key contact groups (board members, local councillors or other main stakeholders). Set a target to approach key contacts personally within a fortnight. For larger groups of contacts, Drupal webforms can allow people to check their details and update them themselves. Or you can use tokens in emails or pdf letters to share the details you hold with your contacts, and provide a channel for them to let you know if anything needs changing.. Conduct a database review with all your staff at once, and identify redundant activities and fields. Larger organisations may want to create a Database User Group to review the database and suggest improvements on an ongoing basis. You can also talk to managers, directors and board members about the reports they need and if current reports are fit for purpose. If you identify gaps in staff knowledge, GMCVO Databases can provide Refresher Training. We can deliver an overview of all database features, or provide more focussed sessions looking at specific functions and features. We'll happily tailor our training to your needs. Alternatively if you have staff who are already experienced in using your database, they can deliver internal training or create user guides specific to the way you work. Get involved with the wider CiviCRM community. The CiviCRM site and the blog posts will keep you up to date with latest developments. CiviCRM Stack Exchange is a great way of contacting other users and asking how they solved problems you face. The CiviCRM User guide gives a detailed overview of how CiviCRM can be configured. If all this sounds overwhelming, we are happy to help and support you review your system. We can advise you about changes you can make yourself, and help you develop a plan for larger scale developments. Is it time for a database review? New to CiviCRM? Ask your staff how easy it is for them to record data. Using CiviCRM for a year or more? Now may be the time to review your data and double check that the information you gather still meets your needs. Whichever stage you're at, GMCVO Databases can help you. Call us to arrange a meeting (0161 277 1020), or talk to us at our next User Network Meeting. These NP Engage blog posts about Spring Cleaning Your Database (part one and part two) gave a really good overview of the issues raised above. CiviCRM Blog- a good place to keep up to date with the latest updates and changes to CIviCRM.